Whether you’ve seen it on an episode of your favorite home renovation show or read about it in a design magazine, there’s no denying that the concept of open floor plan house plans is one of the must-have design trends for new homes today. It’s not surprising, considering the amazing benefits that come from opening up the living areas in a house. One of the biggest issues with many traditional style homes is that so much of the floor space is eaten up by hallways and doorways—which is especially true in smaller houses that don’t have much square footage to begin with. Open concept house plans tear down those walls, eliminate doorways and centralize the living room, dining room, and kitchen into one unified space. This layout provides a great feeling of spaciousness and removes the separation between these important areas. It transforms this section of the home into a place where function and form combine. Gone are old-fashioned floor layouts with narrow passageways, small rooms, and underused areas like formal sitting rooms, cramped kitchens, and enclosed formal dining rooms. 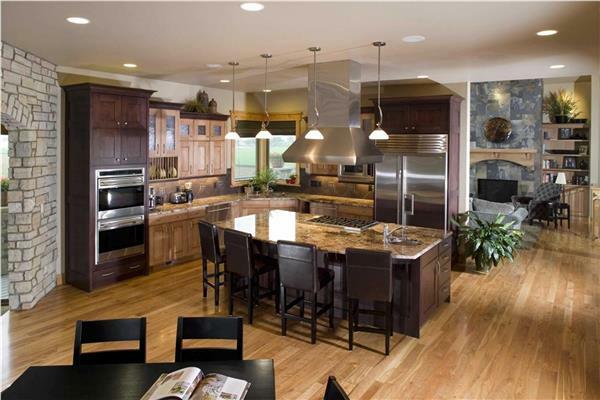 This type of open concept layout is great for anyone who loves to entertain. The host can enjoy cooking, watching the game, and being a part of the conversation, all while preparing the meal in the kitchen. This is also a popular layout for families, as it allows parents and children to hang out in the same spaces. Widening this highly-trafficked area can make the house itself feel much larger. If you’re looking for an open floor house plan with anything from a farmhouse feel to a modern architecture, look no further. Take a look at our plans here, and reach out to our team of experts with any questions you may have.